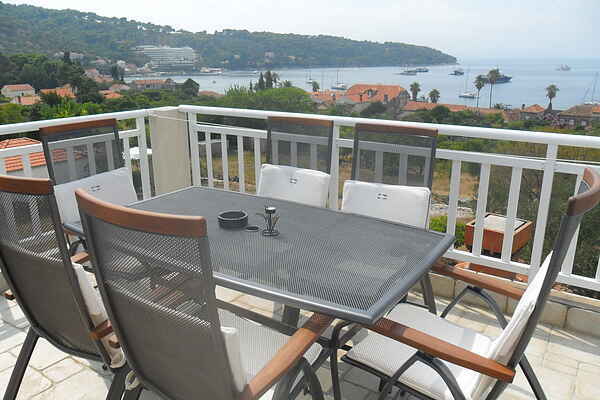 This specious apartment is one of the most large and beautiful apartment on Lopud island. It has two nice bedrooms, two bathrooms, one with a massage shower, the other with a bathtub. A large living room, with sleeping couch for 2 persons, a dining table and kitchen. A large roof terrace gives a beautiful view towards the sea. Perfect resting place for a family or a group of up to 6 friends. Apartment has lot's of privacy and safeness on the island, as there is no cars available. A house is settled in centar of the village, covering 3 apartments and 2 rooms in total, with nice garden around and BBQ for common use. A sandy beach is just 5 minutes by walk from the Villa. Island Lopud - one of the 3 Elaphite islands is well connected with Dubrovnik by boat lines few times per day, so it is very easy to organize daily tour to the ancient Dubrovnik.